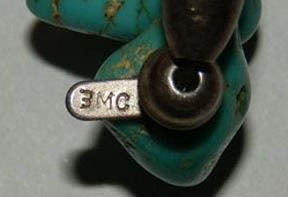 In 1994 Alberto Contreras Sr. stopped using his original "AC" hallmark. It was lost or misplaced. 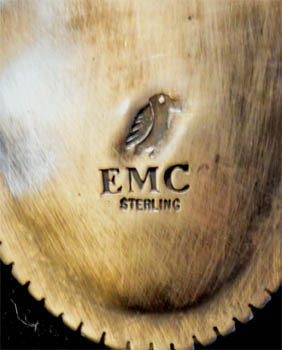 He used a commercially made pair of "A" and "C" stamps, and overlapped them to resemble his original Business Logo. 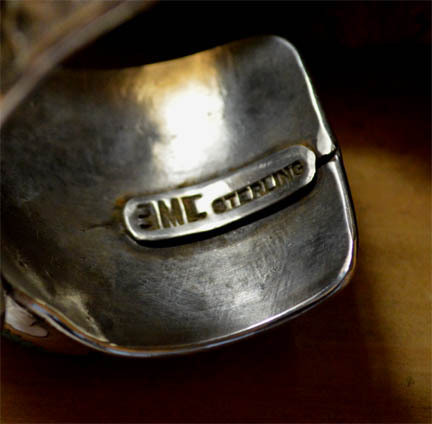 During Alberto Contreras Sr.'s 55 years as a silversmith, he trained at least 24 apprentices. Most of the jewelry items that were made by the apprentices, including myself, were sold in his stores. (Alberto Contreras, and later, Alberto Contreras and Six Sons). 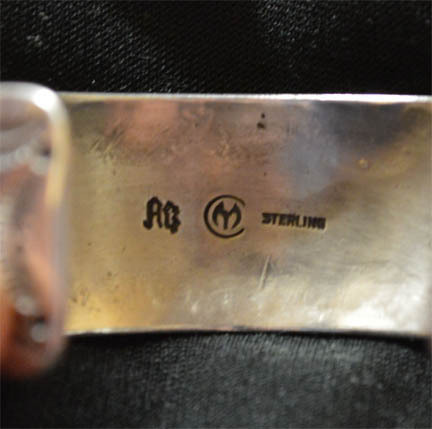 Most of the items made by the apprentices were stamped with his "AC" hallmark, even if the quality of the piece was that of a beginner apprentice. At that time, no thought was given to the potential of his hallmark becoming a high value collectors item. 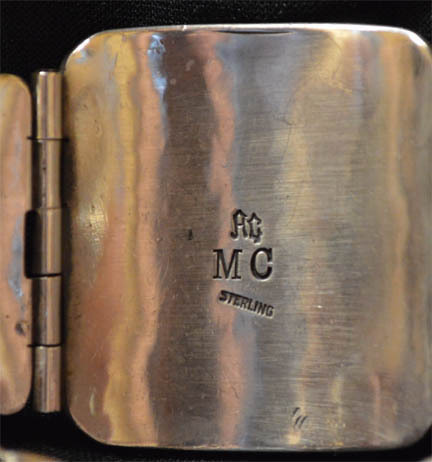 My first hallmark, used in 1968, was to use a pair of commercially made stamps of "M" and "C". My brother Marc also started to use the same stamp, so my "MC" stamp changed a couple of times. 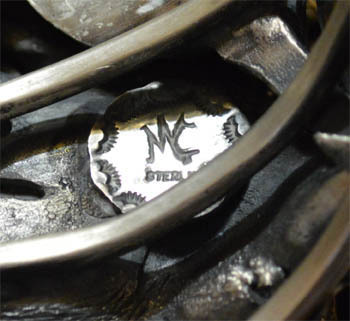 My later "MC" stamps were handmade. I started as an apprentice in 1958, and my older brother, Albert Jr., started in 1957. Later four other brother began their apprenticeships. My brother Richard used an "RC" stamp, and my brother Greg, used a "GC" stamp. Patrick used a "PC" stamp. 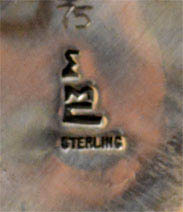 We made a lot of beginner-type jewelry items that we stamped with the "AC" hallmark, only. 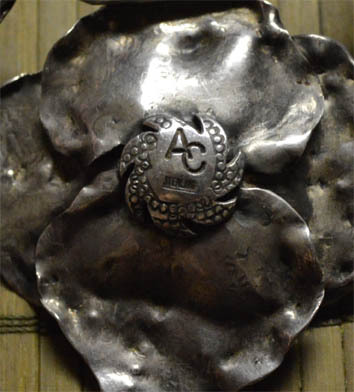 As our apprenticeships advanced, our silversmithing skills developed, and people came to us, to order custom made "Contreras Jewelry", not specifically "Alberto Contreras Jewelry". A lot of these early "apprentice" jewelry pieces are now showing up on the internet as Alberto Contreras jewelry. 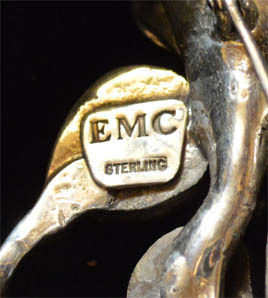 Collectors should be aware of the past usage of the "AC" hallmark. In use: 2009 to April, 2019.
it belongs to another person.